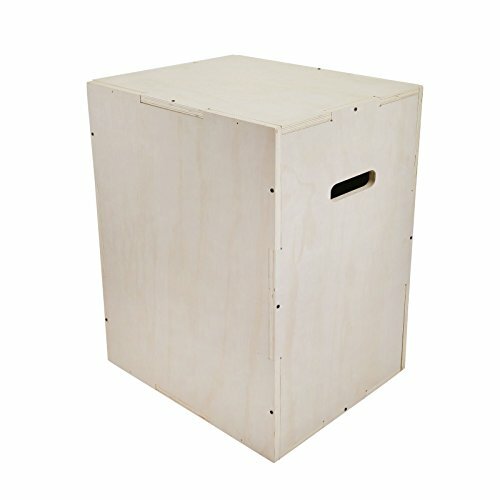 Best Plyo Box in in 2019 - What Need to Know Before You Buy? Power and speed are two great things for muscular strength gains. Those looking to combine strength and cardio understand the importance of plyometric exercises. If you are looking to incorporate this type of exercise into your home workouts, buying one of the best plyo box what you need. Plyometric jump boxes, also known as plyo boxes, are pieces of workout equipment you can utilize to elevate your strength and build an incredible physique. They allow you to burn calories with short exercise sessions. Plyo boxes make some of the popular equipment for upper and lower body exercises. These types of boxes are also very versatile. They are also the best choice if you engage yourself in all forms of athletic training. Many of these exercises are intense and is the reason why plyo boxes have a durable design to support the weight and pressure. They are made of different types of materials, are available in various sizes, as well as the heights. There are so many buying options. While others have fixed heights, you may also opt for the adjustable height plyo boxes. But if you would rather have the fixed types, you can buy them in several sizes for variety and combination. 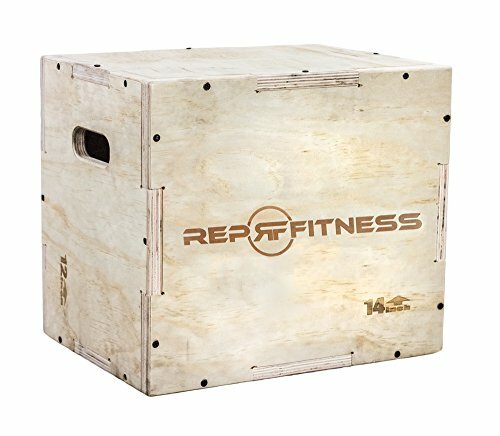 Whichever the choice you make, here is a review and a guide of the top 10 plyo boxes I would recommend. If you are a plyometric exercise enthusiast, this Wood Plyo Box could be the answer to your needs. It is classically designed and it doesn’t lack in what it has to offer. Featuring a construction of a strong 3/4” plywood, the Wood Plyo Box tops the list of the wooden equipment I would recommend. For one, it can support weight for up to 350 pounds, thanks to its strong bracing and puzzle joints. After the purchase, assembly is necessary. Don’t worry, with only a screwdriver, you can have it up and running in no time. It comes already drilled to make work easy for you. The product comes with a smooth finish to ensure your workouts are safe. There are no sharp edges. The corners have a rounded shape, which in no way impacts on the strength of the plyo box. The manufacturer offers you four sizes, that is the 30 by 24 by 20 inches, 24 by 20 by 16 inches, 24 by 20 by 18 inches, and the 16 by 14 by 12 inches. The first three sizes are the most popular. Each of these sizes offers you three workout levels. This particular equipment is perhaps the best adjustable plyo box and one of the most expensive ones on the market. Looking at it, you have to admit it is worth every penny. The Stamina | X Adjustable Height Plyo Box speaks nothing but high quality. The Stamina | X Adjustable Height Plyo Box features a solid heavy-duty steel build. This means that even if you are an aggressive individual and you want to jump vigorously on it, you are sure it is there to stay. It supports users of up to 300 pounds. Because of its collapsible nature, it comes fully assembled. This negates the need for doing the assembly yourself. You can use it straight out of the box. The product features a user-friendly adjustment mechanism. You can simply pull the pin, customize the guard, and tweak the legs for a specific position. Moreover, it also comes with a psychometric workout manual. The Stamina | X Adjustable Height Plyo Box is adjustable to four sizes. It comes with 12, 16, 20, and 24-inch size adjustments. The j/fit Plyometric Jump Boxes are popular in many gyms simply because they are versatile and can be used by several people at once. It is the right choice for you if you are on the lookout for a ply box that doesn’t require assembly. Each of the boxes in the set is made of solid steel for durability. This guarantees safety and a variety of performance. The safety is also enhanced by the rubber stoppers at the base of the boxes to ensure that they don’t skid. It requires no adjustments or assembly. It comes ready to use after the purchase. 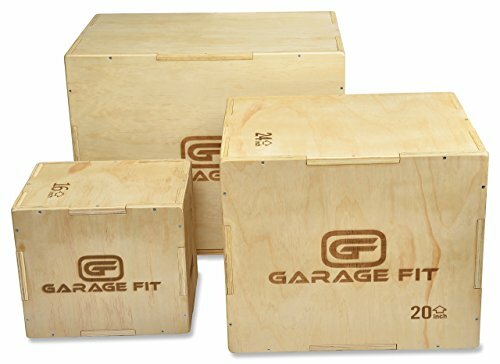 The boxes come as a set of different heights to satisfy the need for step up in your plyometric workout. The platform surface is tapered and non-slip for a seamless performance. Although they weigh about 58 pounds, they are stackable and will save a lot of space. The boxes are available in four sizes with varied square top platforms. The options include a 12, 18, 24, and 30 inches. 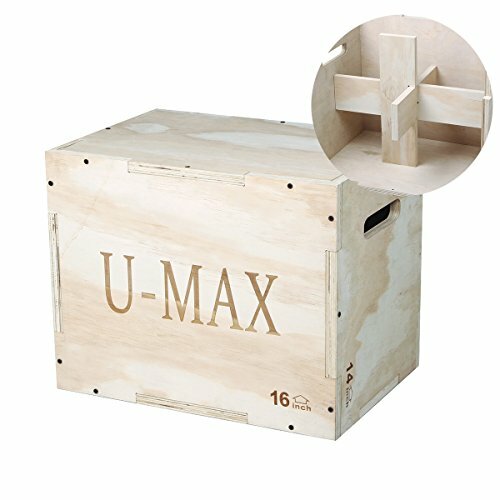 The U-MAX Wood Plyo Box is another impressive and versatile tool you can use to develop the strength. It is ideal for step ups, some squats, and jumps CrossFit workouts among others​. Being a wood product, it is incredibly strong, not to mention how affordable it is. The overall design is shaped like a tank and is shipped as a flat pack. The manufacturer has already drilled holes and interlocking joints into the plywood, which makes the assembly process easy. All you need for the process is a rubber mallet. The U-MAX Wood Plyo Box has been precisely polished to get rid of the sharp edges that might lead to potential injury. Apparently, the wood it is made from is 3/4 inches thick. Apart from the interlocking joints, the extra internal accessories ensure that stability, strength, and durability is maintained. This feature also ensures that the screws used during assembly are minimized. The U-MAX Wood Plyo Box come in three sizes including 30 by 24 by 20 inches, 20 by 16 by 14 inches, and 16 by 14 by 12 inches. This last option comes with no bracings. This plyometric box is the first option if you are thinking of perfect step ups, jumps, box pushups, dip, box squats, and other athletic workouts you can think of. It can adapt to various exercise positions and you can rotate it to accommodate more height. 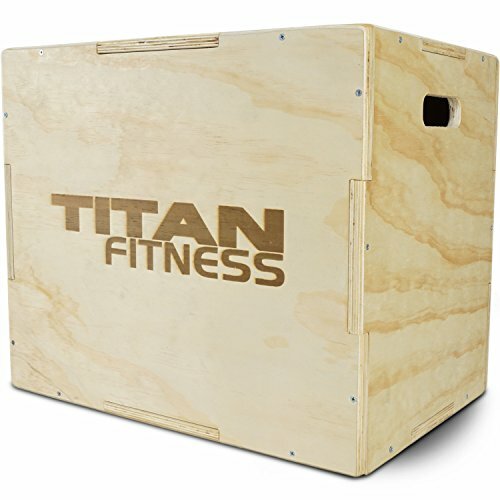 The Titan Fitness 3 in 1 Wood Plyometric Box features a solid wood construction that boasts unmatched strength. It comes disassembled, but with already drilled holes. It is also fairly portable as it weighs only 38 pounds. You can carry it pretty much everywhere you want it to be. Its strength is enough to support users of several weights. You can run comfortably on its surface, which has a non-slip design to ensure uninterrupted workouts. It can be easily assembled and for better fits, you can use a rubber mallet to do the work. Also included are screws you can use to keep all the pieces together. Being a 3 in 1 kind of plyo box, it offers you three exercise heights. You can start with the 16-inch side and slowly progress to the 20-inch side, and finally the highest side, the 24-inch. Among the highly rated plyometric boxes is the Rep 3 in 1 Wood Plyometric Box. I reckon the reason is perhaps attributed to its versatility and stability that it offers. It suffices as a perfect equipment for all the creative workouts you can think of. This product features a solid wood design perfect for supporting several users with different weights. The plywood is the industrial grade with 3/4-inch thickness. Nevertheless, you have some assembly to do. Not to worry though, the assembly screws to install on the already made holes are included. It will take you roughly about 20 minutes to get it up and running. The Rep 3 in 1 Wood Plyometric Box also comes with sanded down sides. This guarantees some level of comfort, safety, and confidence while exercising. The pieces are finely machined for a meticulous fit. Two of its largest sizes come with internal bracing to ensure there will be no wobbling. This ensures maximum strength. The available heights include the 30 by 24 by 20 inches, 24 by 20 by 16 inches, 20 by 18 by 16, and the smallest, which is the 16 by 14 by 12 inches. The Bound 3-in-1 Wood Plyo Box is another product worth having if you need a plyometric box with toughness unlike any other. It weighs about 50 pounds when assembled. This means it is fairly portable and can be placed in your workout area conveniently. This plyo box is made with the same design like a tank, but ideal for Cross fit exercises. Like most of the other wood designs on the market, it features 3/4 inches of plywood, which is pretty much strong to withstand some abuse. It comes already machined for the interlocking joints to perfectly fit each other. The pieces have also been holed for you to find them easy during the assembly. Handling the pieces during and after the exercise is safe. They have been sanded down to perfection. This equipment can comfortably handle a weight capacity of 400 pounds, thanks to its internal bracing reinforcement. You get 30 by 24 by 20 inches, 24 by 20 by 16 inches, 20 by 18 by 16 inches, and 16 by 14 by 12 inches for your jumps and step ups among other exercises. The OrangeA 3 in 1 Wood Plyo Box, despite its funny name, is one plyo box that is worth the value of your money. This training tool is perfect for beginners and professionals alike. 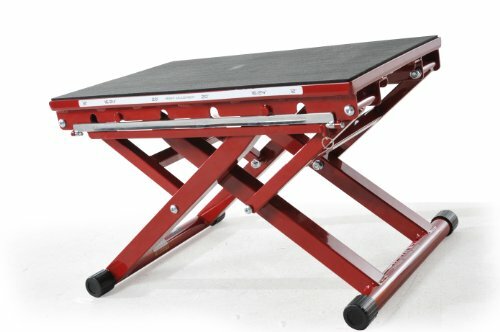 It is a 3 in 1 jump box that offers different height levels to make your workouts even more intense. You can jump on this box all you want, but it won’t break. The 3/4 –inch lumber design is strong enough to resist your vigorous jumping. The recommended weight limit for the plyo box is about 386 pounds. Like many other wooden plyometric equipment, this unit will require some assembly. Aside from the cut-out spaces for easy portability, the OrangeA 3 in 1 Wood Plyo Box pieces include predrilled holes for convenience during assembly. Once put together, you can comfortably do jump and box squats and other athletic workouts for longer than you expect. It is also finely polished to reduce the risk of missed jumps. Using it involves the rotation of the box for different heights. 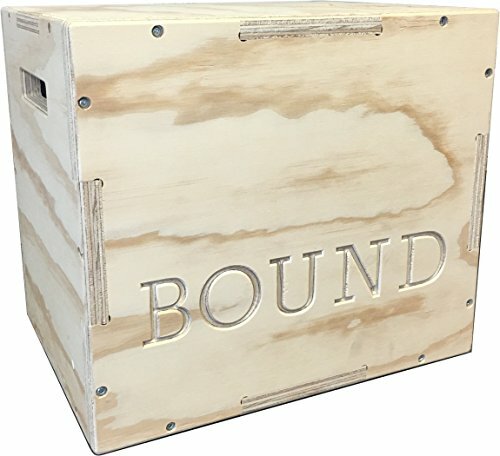 If you are looking for a box with sizes of 30 by 20 by 24, 24 by 20 by 30, and 24 by 16 by 20 inches, this is your product. Some people have a phobia towards the wooden or the metal plyo boxes. If that is the case, I suggest you get yourself the Rep Foam Soft Plyo Box. As opposed to other types of jump boxes, this product is compact, highly stable, and heavy. These boxes adopt a totally different style. They are safe to use and will guard you against missing during your shins. The boxes are stackable and they all carry the same size of base, that is, 28 by 28 inches, for better stability. Made from high durable vinyl covers, they also feature Velcro flaps to keep the boxes safely stacked. Despite their heaviness, you can still manage easy mobility using the firmly stitched handles on the side. The foam is ultra-dense to better your safety. Nevertheless, the zipper safely tacks away. 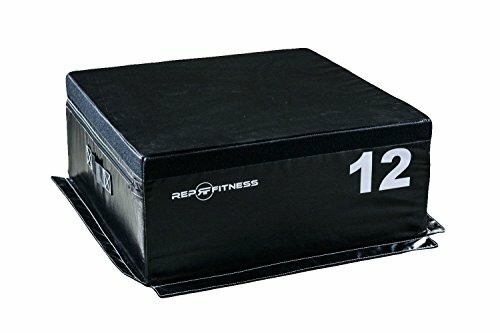 The Rep Foam Soft Plyo Box comes in sizes of 24, 20, 12, 6, and 4 inches. This is versatile enough for several types of exercises. The smallest size weighs 16 pounds and the largest 85 pounds. 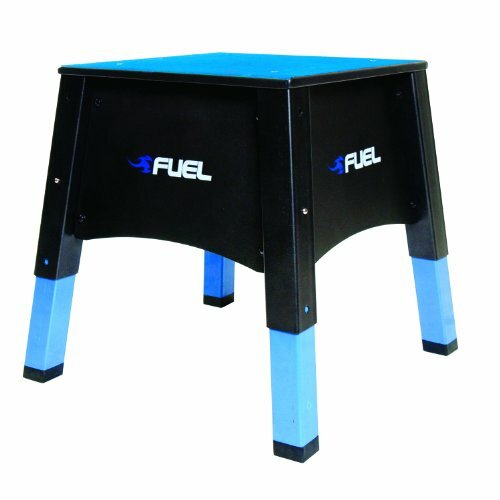 In close proximity, the Fuel Pureformance Adjustable Plyometrics Box looks more of a stool than an exercise equipment. Still, it gets your workouts progressive as you would anticipate. It is the perfect equipment for you to enjoy the speed, the strength, and the explosiveness for your upper and lower body exercises. The Fuel Pureformance Adjustable Plyometrics Box comes with a design that incorporates the high-end, heavy duty steel. This is for strength and durability. Also featured is a spring customization button that lets you adjust the box, for different heights, depending on the goals of your exercise. The box conveniently raises and lowers according to your adjustments. The top is non-skid for safety during exercise. This platform is adequate enough for many. It is a square of 16 inches. Its feet do not scar the floor and you can use them pretty much wherever you want to. Being a single adjustable box, you save lots of space while enjoying versatility. It comes with adjustable heights of 14, 18, and 22 inches. It has long been established that plyometrics or consistent jumping is the key to having rapid-twitching muscle fibers. The workout is very demanding, but requires nothing more than the simple plyo box. Who doesn’t want to achieve a perfectly toned body by jumping in the comfort of their immediate environment? These plyometric units are available in many types. Some carry the design of a stool, while others look exactly like boxes. While others can be flipped for heights, others are stacked. Each of them comes with its own strengths and durability. According to what you desire, there is just the product for you. They comes in various types of materials. Wood and steel construction are the popular choices. There are also others with vinyl and foam while some will incorporate other materials as well. 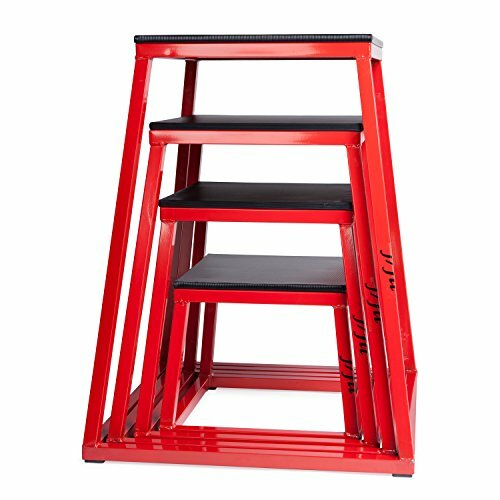 Ensure that the product you choose has non-skid legs and platform for your safety during exercise. Rubber, for instance, is the best choice for a material that doesn’t slip. To make your workouts interesting, you need several jumping heights. Instead of buying one unit at a time, you can choose one that offers several sizes all at once. This decision is also dependent on your needs, your exercise goals, and your height. Slowly, you can start with the smallest as you progress to the larger ones. Do not be fooled by the design of the box and make a hasty decision. Although they look like boxes, they are constructed from high-quality plywood to meet certain specifications. For example, some can support up to 500 pounds. What do I mean? Don’t look at a simple, cheap design and immediately go open your wallet for it. Keep in mind that price gives you a hint of how good the product is. Some plyo boxes made of steel are obviously more expensive than the wooden types. Don’t make a mistake of buying something that will put your life at risk of potential injury. Ensure that you make a sound investment. As already mentioned, some boxes are stackable while others can be adjusted. The technology put into the box matters a lot. Some designs are better at resisting abuse or intense jumps while others will give in wear and tear too soon. Steel plyo boxes have better weight capacity. The wooden box types sometimes, are only as good as you assemble them. They usually come predrilled and holed with screws to help you put them together. While you can choose any of the adjustable plyo box on the market, the question is, will it support your weight? The adjustable types feature several heights with stoppers for versatility. In a nutshell, there is a wide range of designs you can choose from. Eventually, it all depends on your individual needs. If you buy a product with a guide on how to do the exercises, the type of exercise to carry out, and the right size of box for the exercise, you are in luck. You should, however, familiarize yourself with the different variations the plyo box has to offer. You will also learn how to maintain the appropriate posture and which muscles to work on to achieve your goals. They are very important in a variety of ways. They will let you know how reputable the manufacturer is, whether the product does what it advertises, the price, as well as where to buy it. It is determined mainly by the materials the plyo box is made of. The overall build, the structure, the size, and the mode of operation will determine how long it will last. The product you choose shouldn’t have any sharp corners or slippery platform, which should also be adequate for you not to fall. You want to be safe all through your exercise. In case of the wooden types, ensure that it is properly sanded to minimize potential injury. The performance of plyo exercise on the wrong type of equipment has its disadvantages. The best plyo boxes may seem like a straightforward workout tool, but in real sense, if you don’t take care, you will end up with the most unpleasant experience. For one, it will hinder you from achieving your goals not to mention the risk of potential injury. It comes as a recommendation that you carefully weigh your options before deciding on a specific product. Of course, the easiest way is by choosing one from the above-reviewed plyo boxes. There are two choices I would recommend for you in this case. A wooden and a steel type. For the wooden option, the Wood Plyo Box is perhaps what you should try first. It is compactly made from strong wood, it is finely sanded to ensure your safety, and it comes at an affordable price. Nonetheless, you get a variety of sizes to train with. The second option, the steel type, is the Stamina | X Adjustable Height Plyo Box. It is meant to last, it is adjustable, and very easy to use. Its landing platform is decent and non-skid. This means that you can save on space, enjoy your exercises, and at the same time get a satisfying amount of life out of the box. But if you are still in doubt of what to choose, hopefully, the buying guide has enough information that enables you to buy the product of your dream. I hope you enjoyed reading. Don’t forget to share or comment!